Well what a December that was! Carissa set us a target which we all thought was wildly unachievable, and blow me down, we very nearly got there! We had our busiest days ever, but made fewer teas and coffees than we ever had! I can’t believe how much tea and coffee we’ve gone through, and this week, we came very close to running out of coffee – the shelves in the back room had no unopened packs on them! We have however now had deliveries of lots of new coffees for the New Year, all roasted on 2 January when the roasters got back to work so mega-fresca! So, let’s take some time out to reflect on where we are now, and what we have planned for the coming year. The big news for me personally is that I have now officially retired – well, sort of – I’ve taken my NHS pension, and retired just before Christmas, but also went back to work in the same job just before Christmas too! Feels completely different though 😊 Carissa got to her target of 100 sales in her Etsy shop https://www.etsy.com/uk/shop/CarissaTanton?ref=search_shop_redirect and made more and more sales of her lovely artwork in the shop. Jake beat us all in his daily sales in the shop, but he didn’t manage to sell that lovely copper stove-top coffee maker which was his main aim – Carissa sold that one. Santa Claus did bring him an Aeropress and some very nice Esmeralda Geisha though. If you’ve been in the shop recently, you’ll have noticed our Particularly Fine Teas shelf. We’re very excited about this one, and quite honestly, getting more excited all the time. We introduced people to Pu-erh tea, and have some good value Pu-erh’s on the shelf – including our delicious and dinky tangerine Pu-erh’s. Some Pu-erh tea can rightly be called ‘vintage’ and our oldest is 1990, although it’s not a cake, but loose Pu-erh, which tends to age quicker but tastes different. We have two cakes from the Menghai factory, so dry stored, and very expertly fermented. One of them gives you that ‘oo-erh’ feeling that you get after a few minutes of a good Pu-erh, the other less so – more soothing than stimulating, but they’re both very interesting tasting – if you like Pu-erh, that it -it’s not to everyone’s taste. I keep getting told that I should do a Vlog about Pu-erh – I think my enthusiasm amuses people! I’ll be honest though, I’m very much still learning about Pu-erh, so if you know lots, come and talk to us – we love to learn more about tea! Just before Christmas we took delivery of a couple of very nice, organically grown oolongs. The farmer made contact initially in September of 2016, but at that time, while I was interested, I didn’t know if we had the clientele who would be interested in that quality of tea, and also of course the cost. It was also at that time an awful lot of money for me to be spending on that much tea, and I really didn’t know enough about it. Since then, our knowledge and experience and in fact expertise has grown to such an extent, that this tea just had to be part of our range. It’s the first time I’ve bought direct from a farmer, and to be honest, I’ve had absolutely no regrets. I bought Mi Lan Xiang Dan Cong, and Da Wu Ye. We had the Mi Lan Dan Cong from another supplier in October, by a mile the most expensive tea we’ve had in the shop, and I didn’t expect it to sell. We were sold out of it within a month of having it on the shelf! Lots of people have asked for it since, so I was keen to find it, but as this tea is only harvested in Spring, I didn’t expect to find any. I got lucky! Having tasted this, the flavour is stunning, heavy orchid flavour, rich but delicate at the same time. I love it -and we’ll be using this tea in our January Tea Tasting on 31 January which is An Introduction to Gong Fu Cha. The other oolong, Da Wu Ye is more toasty in flavour, but again, delicious. We’ll probably have a horizontal tasting of these two in the January tasting. If you want to come along, you can book on the Events page of the website https://www.seibiantcoffi.co.uk/?event=tea-tasting-2018-01-25. So, what are we planning for 2018, apart from getting to know our new teas and coffees? Travel is on the cards for us, and I’m planning a trip to China to explore some tea growing areas. I’m planning to travel to Yunnan in particular, but I’m also keen to go to the Feng Huang Mountain area, Chaozhou, which is in the Guangdong province, home of our new oolongs. I’d also like to go to Fujian, as I’ve heard of a place called Tong Mu, which is where unsmoked Lapsang is grown – a very scenic area, but I just love the sound of the tea! I’m not sure if I’ll manage to get to all these areas, in the time I have, but we’ll see nearer the time. I’m also making contacts with regard to trying to see if we can grow tea in North Wales. I’ve made some contacts already, and need to work on that. Get in touch if you’re interested in getting involved, in any way, from allotments to try the plants on, or if you have any expertise in that area. If you have a small business and you feel that you would like to expand or develop your tea range – or your coffee range, just get in touch. We are very responsive to queries, and are happy to develop a tea especially for you. We can do private tasting sessions so you can explore the options. You may like to find a tea for your Afternoon Teas, or a breakfast tea for your B&B – we already supply coffee to a number of businesses. We can deliver very freshly ground coffee as often as you would like! 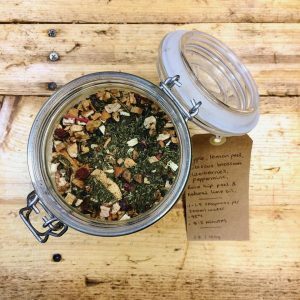 You may recall that this time last year we launched our Teatox Teas – we are preparing these once more, and they should be on the shelves in a couple of weeks – the Morning Detox which is a lively green tea, and the Daytime Detox which is an energy boosting, cleansing tea with nettle and Yerba Mate for the afternoon slump. We also still have the Bedtime No 1, which was last year’s Evening Detox, and was so popular we had to keep it on the shelves all year! We still have Matcha, but we won’t be doing the Powders, as they were frankly disgusting to drink but they did the job in terms of boosting your metabolism – if you want them, we can sell you matcha, and mate/matcha and tell you the recipe! We’re expecting a quiet couple of months, so do take advantage of the opportunity to call in and have an informal tasting any time of day! We don’t need any excuse to taste teas and coffees! Let us know if there’s anything you like, don’t like, or want us to do more of – and you know we like a challenge!! And remember, keep away from them teabags, and drink real good tea!